When I first experienced a Thai curry soup, I was literally blown away with all of the flavors. Curries, whether they be yellow, red, or green Thai curries are just so comforting, most likely due to some of the coconut milk that enriches the broth and balances out some of the spice of the curry. There is one soup that both my wife and I really, really love, and that is Khao Soi. 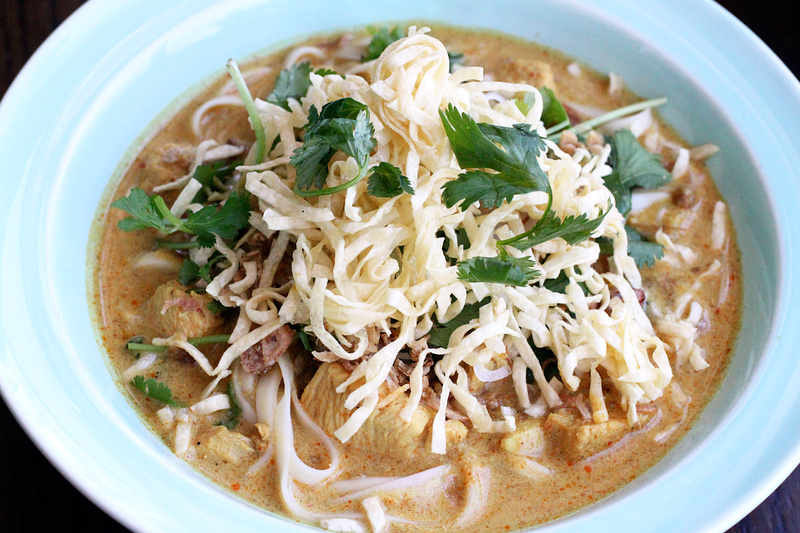 Khao soi is a northern Thailand soup that is very popular, and you can tell why at first bite. A deep golden broth is only the base for this wonderful noodle soup. Trust me, you’re going to love this. Now it’s time for the party. Get your favorite soup bowl out and fill the base with the cooked, not fried, noodles. What I like to do is use a spoon and break those fried noodles into the broth. They add a wonderful texture to the soup. The curry powder balances out the red curry paste like you won’t believe. It’s a perfect balance of flavor, and when you have super tender chicken, along with that broth, and long egg noodle, well, to be that just makes for a great meal. My wife said I should jar this stuff up and sell it. We’ll see about that. I hope you enjoy! My husband and I both love Thai curry soups. One of the local Thai restaurants we frequent offers fried noodles in some of their dishes and we absolutely love it! Such great texture and flavor combos. Hi Courtney, you’re right about the crispy noodles. They add this texture that is unbelievable. Thanks for stopping by and the nice comment. 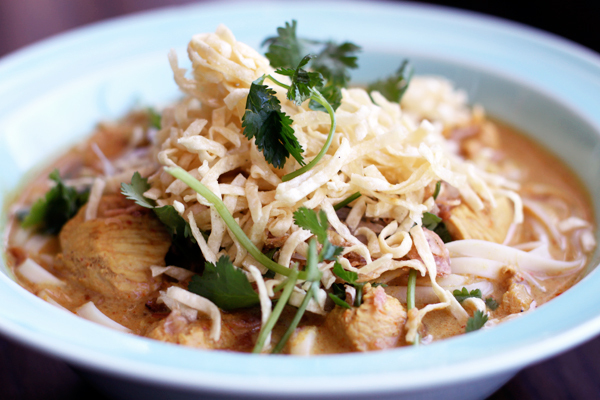 I am so excited to make this, it looks very authentic to the real Khao soi I’ve eaten in Chang Mai. If you ever have a chance to go to Thailand, it is a magical place, and there is Khao Soi everywhere, but once you leave the north you’ll never see it again. Thanks so much for this recipe, it will bring me and my friends back to a vacation of a lifetime! Thanks Kirsten. I have not traveled to Thailand yet, but have had plenty of their cuisine. Thanks for the nice comment! Can I substitute fresh for these items? I don’t have an Asian grocery near me, and I have never seen either of these in the Asian section of my local stores. Or maybe I could fry up some fresh ones myself? I know it would work, but do you think the flavor profile will be appreciably changed? Hi Savannagal. You can definitely make your own. I would fry them on a lower heat, and remove them just until they get golden. Fresh would change the flavor profile a bit. Hi, I’m a little confused. In the ingredients it says “17oz (2 cans) coconut milk” but the photo shows two 13.5 oz cans. Should it be 27 oz. total instead of 17?